Habit: Annual to large shrub, stiff. Leaf: simple, alternate. Inflorescence: heads disciform, many, in +- flat-topped or panicle-like clusters; involucre +- hemispheric; phyllaries graduated in 3--6 series, outer leathery distally, inner narrower, +- membranous; receptacle flat, epaleate. Pistillate Flower: many; corolla very slender, 4--5-lobed. Disk Flower: few, bisexual or staminate; corolla 5-lobed, pink or purple (in California); anther bases short-tailed, tips +- ovate; style branches 0 to short, obtuse. Fruit: +- cylindric, grooved; pappus 1 series of slender bristles. Habit: Plant 1--5 m, not scented. Leaf: sessile or subsessile. Inflorescence: involucre 3.5--6 mm; phyllaries brown-purple. Pistillate Flower: corolla 5--6.5 mm, pink to deep rose. Disk Flower: corolla 5--6 mm, pink to deep rose. Fruit: 0.5--1 mm, smooth. Chromosomes: 2n=20. 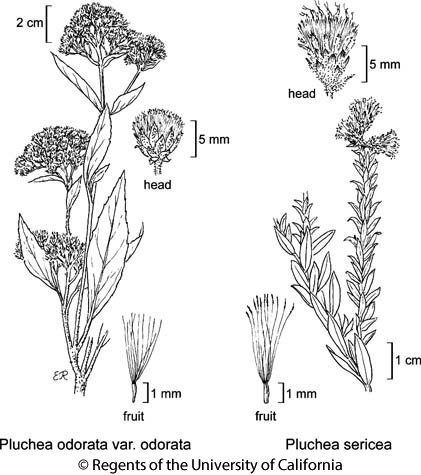 Citation for this treatment: David J. Keil & G. Ledyard Stebbins 2012, Pluchea sericea, in Jepson Flora Project (eds.) Jepson eFlora, http://ucjeps.berkeley.edu/eflora/eflora_display.php?tid=4438, accessed on April 24, 2019. SnJV, s CCo, SCoR, SW (exc n ChI), D; Markers link to CCH specimen records. Yellow markers indicate records that may provide evidence for eFlora range revision or may have georeferencing or identification issues. Purple markers indicate specimens collected from a garden, greenhouse, or other non-wild location.